...over the last couple days I've been experiencing 4.5 "freezing up" with a Windows "Not Responding" error when trying to apply textures using Silkessence (Fabricator) and Fisty's Sparkles in the surfacing tab on some clothing content. The two clothing items I was using when the conflict arose are the Classy Swimsuit and the Mall Girl Jacket in different scenes. I ran an extensive number of tests, just using one figure with no other props background or lighting (just using the preview lights) trying different approaches, and in all instances, the application would stall. The version of Studio I am running is 4.5.1.56 (which is the most recent "stable" version) on WIn7 Premium 64 bit (build #7006) with the most recent updates. With the both items all the Silkessence textures it to lock up while only the Velvet textures in Sparkles do so. I zeroed out the original shaders (selecting "None" in the Surfaces tab) before applying the textures, but that didn't help. I even uninstalled/reinstalled all the Fabricator plugins as well as the swimsuit, yet the issue still persists in every test I ran. I am unable to view any logfile to determine the possible cause when this occurs as the application doesn't exactly "crash" (which would normally generate the usual crash report that could be filed with a support ticket). For some reason Win7 has me locked out of the Application Data folder where this is is stored (as well as other ones like "My Documents", "Start Menu" etc) even though I have "Administrator" status (another can of worms I've been dealing with to no avail). I find this issue of the application stalling to be rather frustrating after spending nearly eighteen months researching components, hardware compatibility, system design, and dropping over 1,200$ to build a system that should be able to handle the demands. It has more than enough processing power (8 threads) and Memory (12G) as well as a dedicated GPU with 1GB VRAM with the most up to date drivers (OpenGL 4.3). I've also used the Fabricator and it's expansions on my old 32 bit XP system (that had the old Intel Integrated Chipset) without such issues, so this really doesn't make any sense as to why I'm running into this on a system with far superior processing and memory resources. When I monitor the application's performance in Task Manager, it shows minimal CPU and memory load at the time. In the processes tab, the Daz Studio process shows absolutely no change in activity whatsoever in either CPU usage or memory committed. For all intents and purposes it appears to be hung up in some kind of infinite loop which can only be exited by ending the entire process tree thus shutting down the programme. I cannot even save the scene after the shader change as clicking on anything in the UI sends teh application into the "Not Responding" loop. The only conclusion I can arrive at is that it must be some kind of odd bug in 4.5 that is triggered by these particular mesh and shader combinations (and who knows which others I haven't run into yet?) along with possibly something in the way Win7 handles the operation. I had no problems loading a Velvet preset from Fisty's Sparkles onto the Mall Girl jacket. Have you run a HDD diagnostic in case those textures aret in bad sectors? I also use the Silkessence shaders a lot and am using the latest version of daz and have encountered no problems. And my system is no where near yours, Kyoto Kid in terms of ram or processor power (my system is 2.6 duel core processor with only 3 gb of ram running win7 64 bit OS). ...the HDD is brand new. 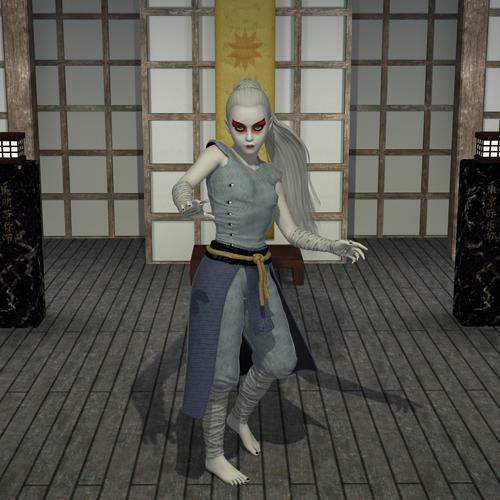 I've used the SIlkessence textures on other clothing meshes (most recently Immortal Ronin and shirt from the Morphing Business Suit) without this occurring. Similarly, I can use the Mall Girl jacket and Swimsuit with their own textures or other maps through the fabricator, (including freebie ones) as well as make adjustments to tiling density with no issue. This is why I don't I don't think it is sector related with respect to the shaders, otherwise it would hang up on whatever clothing I apply them to. #1 Mall Girl Shirt Using Fisty's Sparkles - Sequins. 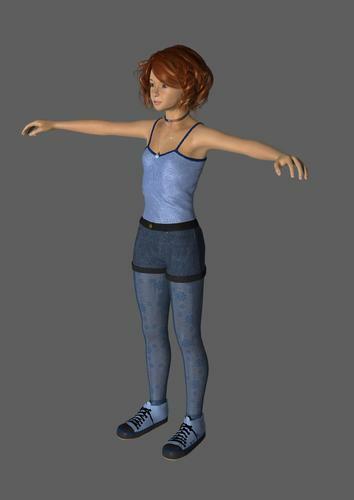 Shorts retextured with Fabricator - Freebie Map, Shoes and Tights with Diffuse Colour adjustments. 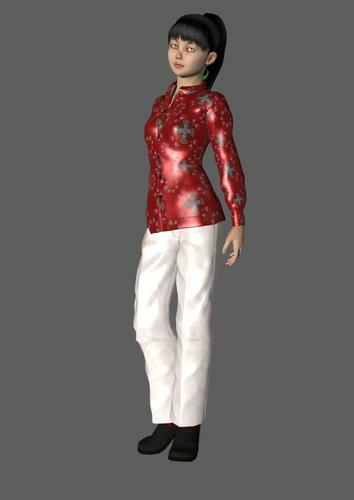 #2 Morphing Business Suit: Shirt Using Silkessence - Red Flowers Map, Pants using Plain Silk - White Map, Shoes and socks with Diffuse Colour adjustments. This is interesting, as I've also been getting strange hangs when applying shaders to almost any item. I find I get this only (so far!) when I attempt to set presets which change between different shaders (e.g. omUberSurface to omHumanSurface, or omUberSrface to DAZ Default Shader). For me this has happened with Silkessence, Leatherize and Fisty's Sparkles (it can happen for me with the Sequins or Sparkles as well as tthe Velvet presets). But it doesn't happen every time, just often enough to be annoying. I have just tried loading the same item (Eastern Riding Wear Top) in both, then applying a series of shaders to the same (single) MatZone. I have found no problems at all in DS4.0, but frequent hangs in DS4.5. As you see above, I'm still running a fairly old version of 4.5 so this is not exactly the same as yours, however I get precisely the same symptoms of virtually zero CPU usage, nothing apparently happening, but clicking anywhere gives "not responding" and I have to cancel DS. Unlike you, I have been able to look at the log file and there is nothing at all unusual, except that the log ends abruptly at the point of hang. ...I'm considering filing a support ticket about this. The odd thing I had no trouble with app hanging up while using the plugin on my old 32 bit XP system with integrated graphics. This is why I am baffled by it doing so on a system with nearly 6 times the available memory, four times the processor threads (all dedicated to running Daz Studio), and dedicated GPU with 1 G fast VRAM and OpenGL 4.3 support. I also had 4.5 crash while working on (not rendering) a scene recently. Again the memory commitment was low (about 2.5G) and CPU load minimal. The crash usually would usually occur when I was switching between the Posting/Shaping and Surfacing/Rendering tabs. The only thing I can think of is that it might have been due in part to the number of objects in the scene (160 individual props), however, I experienced no sluggishness of the viewport when posing, transitioning, or performing camera moves. ...is that the latest beta? I'm still using version .1.56. After my experiences with 3Advanced, I tend to stay away from beta releases. Hmm.. question. Do you get a HANG (Daz not Responding) every time you use the shaders on just those items? And if so does it happen on all mat zones or just one? This may not be terribly helpful, but with 4.5.1.6, there was a known bug that meant that the Ubersurface versions (and sometimes the HSS versions) would hang Studio. The bug was in the underlying Ubersurface/HSS installation, not in the shaders. I got the "Not Responding" message every time I used them. However, that cleared up with 4.5.1.56. Maybe you've got an old installation of Ubersurface hanging around, although I'm not sure how you'd be able to tell. If you've got Ubersurface2 (purchased separately, doesn't come with Studio), try resetting and reinstalling that. Otherwise, you might try uninstalling and reinstalling the shaders themselves. Well, I don't know about Kyoto Kid, but I'll bet this explains my problem - guess I'll have to upgrade to 4.5.1.56 (or maybe the latest beta). Thanks for the info, vwrangler. ...the main hang up occurred when I tried to apply the Silkessence textures to the Mall Jacket - front, back & sleeve zones. @vwrangler, thank you for that information. I was using one of the Velvet Sparkles ones which is HSS. This is a full clean install of .1.56 on the new machine so I would think it should have the updated version of the built in UberSurface plugin. Never purchased US2 as when it came out I was still on the 32 bit machine which had difficulty rendering anything that used advanced surface and/or lighting tools. Off to test in DS4.5.1.56 with full clean install. My PC pretty close to yours. I have all items needed to test now. I have also experienced Not Responding hangs in 4.5.1.56 when applying a shader that switches the shader type to one of the advanced shaders (uber/etc). It's not consistent, however, so not sure what triggers it when it happens. I have just put Mall Jacket all matzones through Silki and did not hit one bump. I even tested the rest of my Fabricator sets as well. Nothing on my PC. I'm sorry I was no help. None of the other items caused any issues from the Mall set either. Seems to be a random occurrence considering cwichura has experienced similar issues. This is very disconcerting. I have the Runtimes/Library on a separate drive but I don't think that should have anything to do with this. It shouldn't as long as the Paths are mapped properly in DS. Speaking of, would you mind posting a Shot of your Content Directory Manager with all Paths expanded? It wont hurt to just look and see. ...OK, here it is. Had to transfer from the other system. 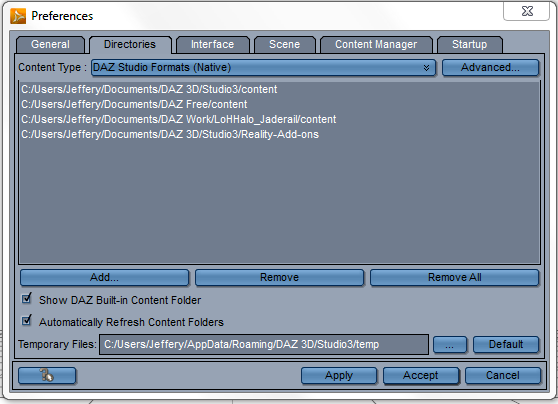 Okay it's all fine EXCEPT the bottom Daz Studio folder, in Win7 you can not have any Content in the Programs folders. Just move that one and Remap it. 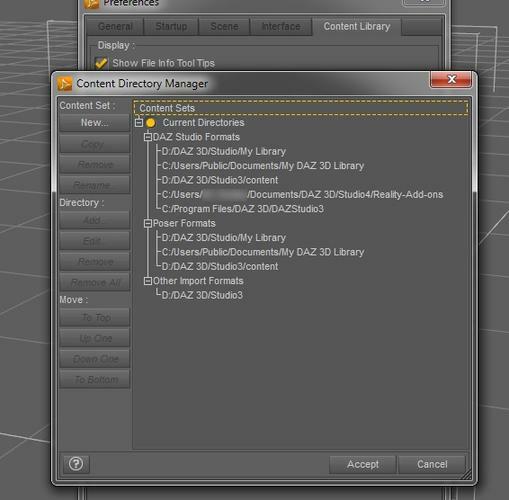 You might add it to the Poser section at bottom as well if it has a Runtime inside it. Other than that it's 100%. ...but Studio3A always installed into the Programme Files folder by default (at least in XP). If I move that, won't it break a lot of existing paths which in turn will pretty much trash all my current and WIP scene files? No all the paths are Relative and addressed within the folder. Just do not rename the folder only Move it and Remap it. To test this do this instead, COPY it to another place, then point DS to the Copy and just remove the old Path from your list. Then test everything. Once you see if all is well, then and only then remove the folder from the Programs Files folder. By the way my last PC was XP and my content was in that path as well. I moved it without any problems. And here is my DS3A content on my PC right now. ...I rarely ever use the "Documents" folders and even have Word and Excel redirect files to more "pertinent" folders folders on my desktop (on the XP machine - don't have any office productivity software installed on the workstation). Just one less hoop to jump through. If I'm not correct the one i would normally install into is locked and I have no access to it even though I have admin status. I have no secondary accounts set up as I am the only one using the workstation. Sorry was so long getting back, I needed some sleep. You do not need to use Documents, any folder will do. I just dropped mine there to get DS3A up and running fast. ...no problem, sleep is good, just ask any feline. So if I move the Folder to the "C" Root and remap it, I should be OK? I looked at what was there, and yes, all the Omnifreaker stuff is in that folder so that most likely was the reason for the hangups. So Studio definitely has a bug with switching shader type when a mat pose is applied. I just had it go Not Responding applying a human skin (that uses the DAZ Default Shader) to one of the Bot Genesis geografts (which had the Skin material set to the BotMetal custom shader that they load with by default). So it's not specifically going from Default to one of the advanced shaders; it happens going back as well. And I doubt it's my content library layout. I have only one content folder, and it lives in /Users. The Default Ds shaders are known to be buggy. I think they need recompiled. @KK any none Protected Folder should do, that should work fine.